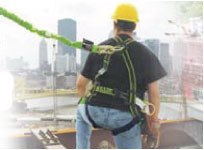 Falls are among the most common causes of serious work related injuries. Employers must take measures to prevent employees from falling off overhead platforms, elevated work stations, or into holes in the floor and walls. Each worker must be thoroughly trained and all equipment should pass daily inspections.